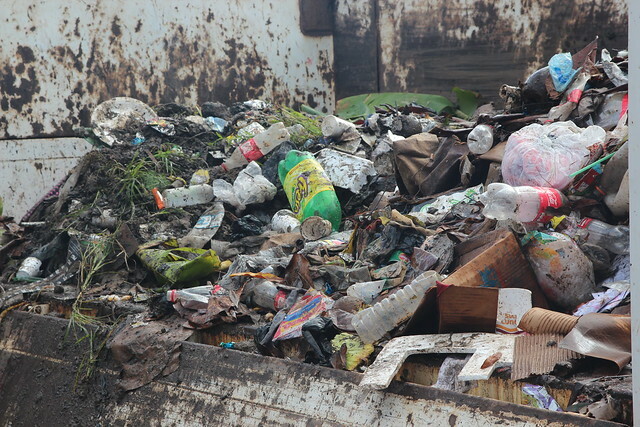 This post will explain the step-by-step process of how a student team gained and understanding of the formal waste system in El Rama, Nicaragua. This process included observations of the current solid waste collection system and disposal process. 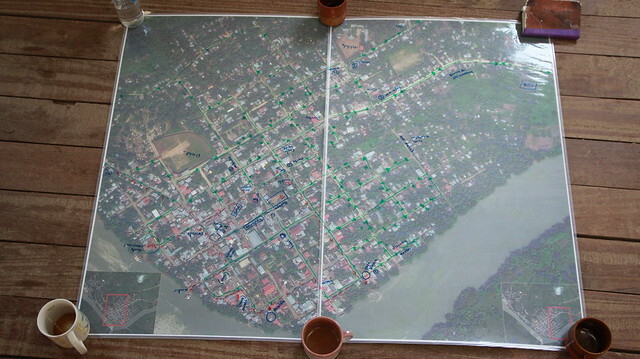 It also incorporated meetings with the municipal government and informal recyclers (pepenadores), and participatory mapping activities. The bodega in El Rama Central, where the municipal government stores Rama’s waste collection vehicles. 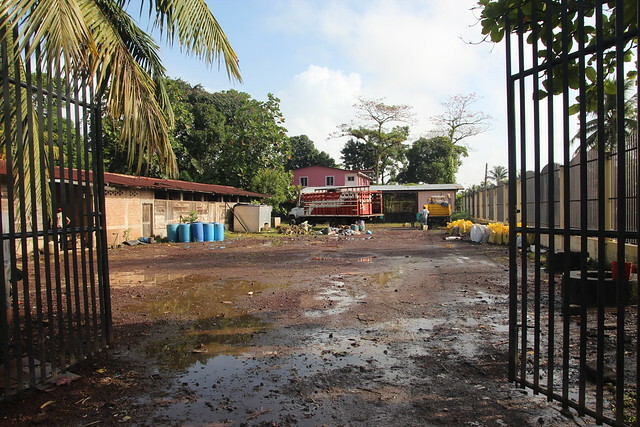 In January of 2013, a team of MIT students conducted a waste management analysis for five municipalities in the Region Autonoma del Atlantico Sur (RAAS) of Nicaragua. Dorian Burks, Shanté Stowell, and I, Eliana (Elli) Blaine, were on this team. One of the goals of our group’s project was to understand the current formal and informal systems of trash management in El Rama. So on our second day there, we focused our attention on government services: we rode on the government trash truck and met with government employees to experience the collection route and find out more about the pieces of the formal system. In the morning, we met at the “bodega,” a large space where the two main municipal trash trucks are kept. The word bodega usually refers to a warehouse, though it can also mean a place for storing materials or equipment. The bodega where the trash trucks are kept is located in the heart of El Rama Central, an open lot with a building that has a couple of car-port bays. The bodega also serves as a depositing location for waste swept up by the two municipal street cleaners, before transportation to the vertadero (dumpsite/landfill). We met the men that work on one of the trash trucks, and hopped on the truck to understand a portion of the collection route within El Rama Central (downtown Rama). Though we knew that El Rama does not have any formal process for waste separation, we were surprised to see whole banana tree trunks, leaves, large amounts of yard waste, and other organic material intermixed with inorganic household and business waste. The government employees stressed that this was an issue: the organic material takes up a great volume in the truck (necessitating more frequent trips to empty at the dump). We raised the point that the organics also weigh more than the other waste, thus the trucks require more gasoline for transporting the not-separated waste. Juan and Julio shovel waste swept up by Rama’s street cleaners into the collection truck. The waste is not presorted, and there is a high percentage of organics intermixed with inorganic waste. We also noted that there are many different ways that trash is put out on the street for municipal collection; there is no uniform method. Waste is collected mainly in large blue barrels and plastic sacks, as well as woven wicker baskets, buckets, metal, plastic or cardboard boxes, small informal containers, or just thrown in a pile around other containers. We noticed that this unpredictable mix of methods makes the government employees’ jobs variable and challenging. A small sampling of the range of trash collection methods and containers along Rama’s streets. In early November 2012, Nicaragua had their municipal elections; the Sandinistas won over the PLC (Partido Liberal Constitucionalista). The way that elections work in Nicaragua, if the party changes with elections, almost all government positions are filled by new employees. This significant turnover makes for a common lack of continuity in programmatic activities. Elections occurred in November, and the positions turned over formally on January 11th. 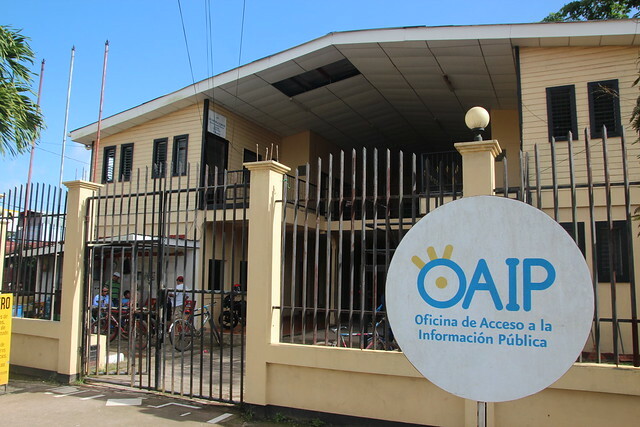 The offices of El Rama municipal government employees. It was important for our group to meet with the outgoing director of municipal trash collection services and other government employees involved with trash management before the turnover. The intent of the meeting was to have an initial conversation about how the current government waste system could link with those involved with informal recycling processes, so that both the needs of the alcaldía (government) and those of the pepenadores (waste-pickers) are met with a formal waste system. We met with Javier, Encarnación, Gomez, and Marvin, who are employees of the outgoing government, along with José Alexander (the son of Doña Rosa, the head of an informal plastic recycling business). 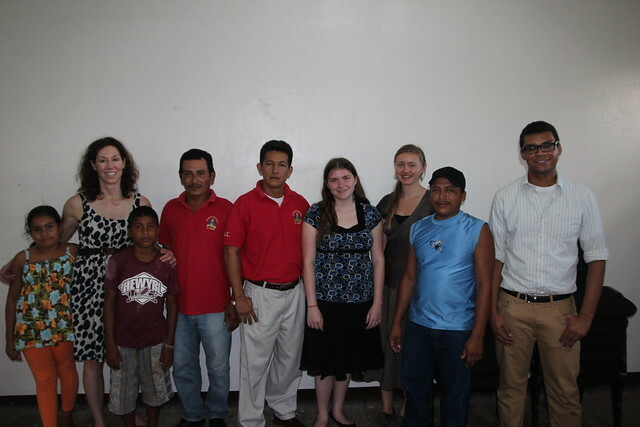 Our student group, instructor Libby McDonald, employees of the outgoing government, and José Alexander – a representative member from the group of Rama’s main plastics pepenadores (informal recyclers). All were involved plotting the current trash collection route. 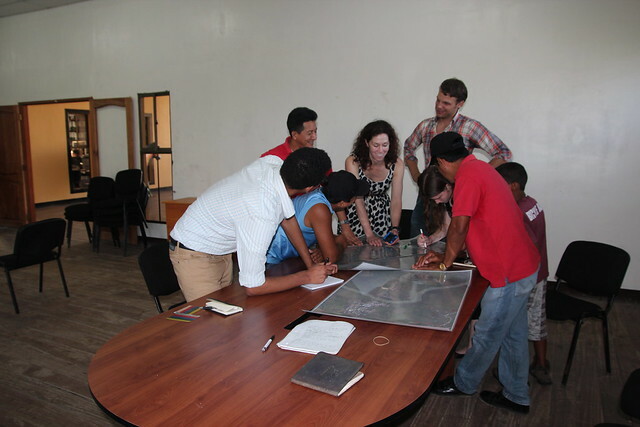 Throughout our work in Rama, we focused on using a participatory planning approach, important for facilitating citizen participation, and successful, sustainable planning. Part of our meeting with the alcaldía and others was devised as a participatory activity. 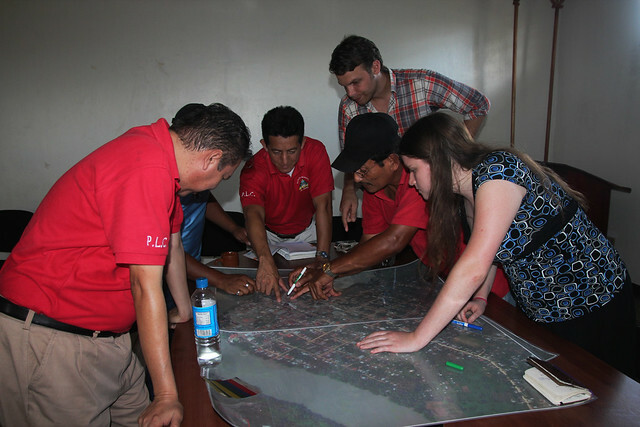 We brought laminated aerial maps of El Rama Central, the surrounding semi-urban neighborhoods, and the vertadero (dumpsite/landfill), so that we could get a visual understanding of the current government collection routes. We were uncertain how well the aerial map perspective would translate in El Rama, and were happily surprised. As soon as we placed the maps on the table, everyone was absorbed. We spent around an hour mapping out the routes with dry erase pens. We began by mapping out the municipal trash collection system. 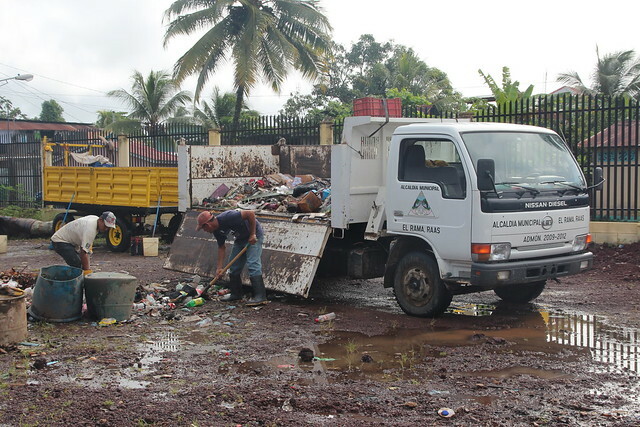 After we identified the days for each route and the process of collection, José Alexander traced out a potential route for additional collection, specifically for the businesses (hotels, restaurants, and stores) in El Rama that produce the most waste. The idea was that current informal pepenadores could expand their business by collecting presorted recyclable plastic bottles from these businesses, thereby increasing the amount of plastics they have access to, and also doing the businesses a service by providing consistent collection. Our team brought laminated aerial maps to facilitate mapping out the current municipal government trash collection routes. It was incredible to see how well the maps facilitated the process of gaining an understanding of the current collection system. People were able to interact dynamically and be involved verbally and visually. The maps made the routes come alive for our group. The activity was productive, and helped us understand how complicated the system for municipal collection is. Bringing the maps allowed us to all start with a visual understanding of El Rama’s layout, which was important because our group did not have an intimate understanding of the streets by the second day. Mapping out the routes with outgoing government employees, and José Alexander. Figuring out the routes was a participatory and engaging process. At one point in our meeting, a boy of about 9 years old came into the room looking to sell food. He asked a couple of us to buy his product, then saw the maps on the floor. He set down his box of food, knelt down, and began looking at the maps intently from multiple angles, pointing out roads and other spots on the map. Meanwhile, most of the others were still involved with mapping out the route at the table, so the boy had space to visually explore El Rama in what we believe was a really new way. He was drawn into the process, and started helping us by pointing out and describing different places in Rama and surrounding areas. 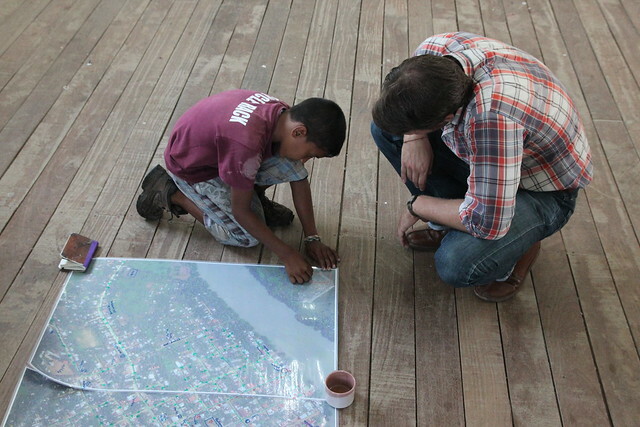 A local youth immersed in mapping with Peace Corp volunteer, and our group coordinator, Whit Johnson. Overall, our exploration of the collection route, the meeting, and the mapping activity jump-started our understanding of the municipal collection route. It also facilitated an initial vision of how the current informal recyclers could be more involved with collection in El Rama Central, and potentially the surrounding unserviced neighborhoods as well. It is projected that this upcoming summer, the pepenadores will formalize a system of collection of presorted recyclable plastics from businesses in El Rama Central. Post and photos by Eliana Blaine.